Some of the finest furniture of the American Federal period was made in Boston, which was the economic and social hub of New England during t he early nineteenth century. One of the rarest and most beautiful chairs made in Boston during this period was a Hepplewhite style inlaid dining chair which has often been attributed to the shop of John and Thomas Seymour, who worked in Boston from 1795 to 1820. Our American Federal ClassicsTM replica of this exquisite chair has a square back with an arched top centering three vertical splats with inlaid colonettes and leaf carved capitals. The back and the square, tapering front legs are inlaid with holly stringing, and the shaped "saddle" seat echoes the arch of the crest rail to complete the symmetry of this rare example. 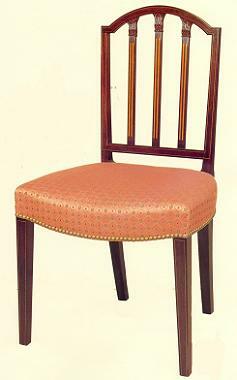 Like our other replicas, this chair has mortise and tenon construction throughout, exactly like the original. Our natural hand rubbed finish complements the select Honduras mahogany used in this fine replica.